What Is Sesame Seed and How Is It Used? Sesame seed has been used as a condiment and a source of edible oil for over 5,000 years. Its use is as common as topping a sesame seed hamburger bun, sprinkled on a wide variety of Asian dishes, and studding crackers and sweets in South Asian, Middle Eastern, Mediterranean, and Caribbean cuisine. Sesame seed is the seed of the sesame plant (Sesamum indicum). The plant is an annual herb with foxglove-like flowers that produce pods containing the edible sesame seeds. The pods burst open with a pop when the seeds are mature. The hulls are removed as they contain oxalic acid, which gives a bitter flavor. The seeds can also be pressed for sesame oil. Besides use as a condiment, in Asia, the toasted seeds are used to make sesame paste, which is often used as a peanut butter substitute. In Middle Eastern and Asian cuisine, the untoasted seeds are used to make tahini paste. White and black varieties of sesame seed are available. The white has a delicate flavor and can be used in all dishes calling for sesame seeds. The black seeds have a richer flavor and stronger aroma and are best used alongside other bold ingredients so as not to overwhelm the dish. However, the choice of black vs. white sesame seeds is usually for the appearance more than the difference in flavor. Sesame seeds have a nutty, slightly sweet taste and aroma which is enhanced by toasting. The black seeds are said to have more bitterness. Lindsay Kreighbaum / The Spruce. Toast sesame seeds to bring out their nutlike flavor. There are two methods: dry toasting on the stove top and baking in the oven. The stove top method is quicker; simply place an even layer of sesame seeds in a dry skillet and cook, stirring occasionally, over medium-low heat until the seeds are golden and fragrant—about three to five minutes. Alternatively, you can spread the seeds on a cookie sheet and toast them in a 350-degree Fahrenheit oven for eight to 15 minutes, stirring often, until golden brown and fragrant. As a condiment, you can sprinkle toasted sesame seeds on top of stir-fries, salads, and soups. The untoasted seeds can be used to make tahini paste, which is an ingredient used in many Middle Eastern dishes. The nutty flavor and crunch go well with many kinds of baked goods, both sweet and savory. Sesame seeds are available packaged in the spice section of grocery stores, as well as in bulk quantity in health food stores and Middle Eastern markets. Due to their high oil content, the seeds will quickly become rancid. It is best to purchase them in small amounts and use them quickly. Sesame seeds should be stored in an airtight container. Unrefrigerated seeds can be kept in a cool, dry place for up to three months. If you refrigerate the seeds, they will last up to six months; frozen ones will be good for up to one year. Sesame oil, on the other hand, is remarkably stable and will keep for years without turning rancid, even in hot climates. Sesame seeds are rich in minerals; they are an excellent source of copper and a very good source of calcium, iron, magnesium, manganese, molybdenum, phosphorus, selenium, and vitamin B1. They have two types of beneficial lignan fiber that are not found in other plants. 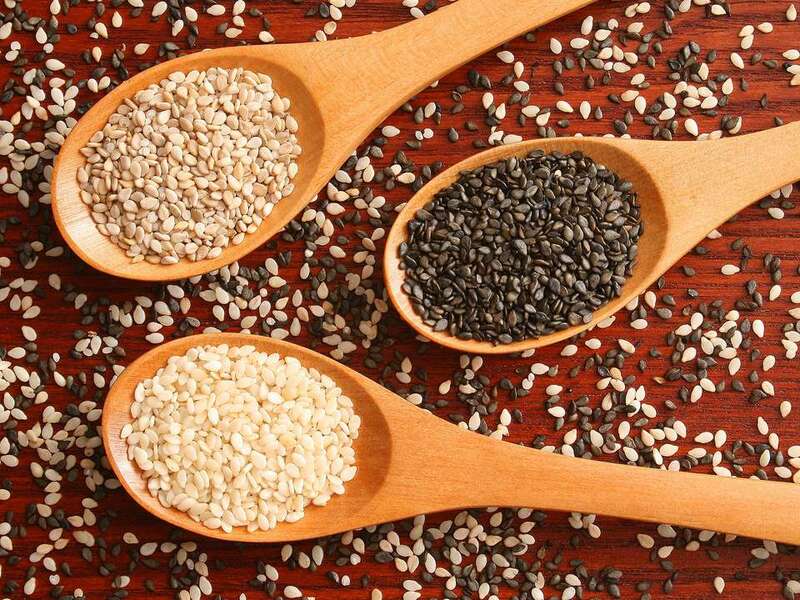 Three tablespoons of sesame seeds provide 3.5 grams of fiber (12 percent of the reference daily intake). Not only is this fiber good for digestive health, but it may also have effects in lowering bad cholesterol. While sesame seeds have a high fat content, it is primarily polyunsaturated and monounsaturated fat. These seeds can be a good source of protein, with 5 grams per 3 tablespoons. They have a very low glycemic index, meaning that they do not provoke a rise in blood sugar level after you eat them. What Should You Look for in Sesame Oil? Do You Know These Six Different Types of Onions? What Can You Do with Papaya Seeds? What's the difference between chocolate and cacao?